Second, in different parts of our orb I meet and get chatting to all sorts of different types of folks: company employees, partners, customers, journalists, cyber-police, and sometimes minsters and chancellors! Now, more often than not, if we chat for more than several minutes, the conversation invariably turns to non-work subjects, like current affairs (hmmm, too political for my liking), or, if I’m the initiator of topics, to: ‘So, what sights do you recommend I check out while I’m here?’ This leads me to all sorts of wonders of the world – both well-known and not-so well-known, many of which become must-sees in my various lists. For example, Chinese colored rock formations, Kimberley in Australia, and the Irish Cliffs of Moher. Third, there are, of course, places with well-known names, which hardly require anybody’s recommendation. For example, the Grand Canyon, Taj-Mahal, and Victoria Falls; these are in a top-priority list (coming up soon), the entries of which require mandatory inspection – by everyone! – asap, IMHO :). Fourth, often my friends, colleagues, or just like-minded fellow adventurers return from some unusual/obscure/remote places they’ve just ‘discovered’, and I can’t get a word in edgeways as all they do is prattle on about how amazing and must-see those places are. Examples: Kilimanjaro, the Kurils, or the Buddhist temples in Southeast Asian jungles. Fifth, I often learn about interesting must-see places in the comments section at the end of my tales on this here blog. To the authors of these recommendations: many thanks! Such readers’ tips have led me to the red rocks and arches of Utah, the Bonneville Salt Flats, Antelope Canyon, and the rocks in the Chinese Zhangjiajie national park. And I’d heard so many good things about Kamchatka and Altai since childhood that there was no way they’d ever be left out. So that’s how I ended up with a pile of place names from all over the world that were deemed must-see – but there were more than 100. So how did I get down to 100? By selecting what I consider to be the most beautiful and/or unique/unusual places. In other words, the list is wholly subjective. Some folks prefer trees in parks and flowers in gardens to volcanoes and geysers. Others’ idea of beauties of the world is exclusively sybaritic-gastronomic. For still others, all that leaves them cold, while mountains and glaciers float their boat the most. We’ve a saying in Russia: you can’t argue about tastes. So I won’t. And please don’t too! Instead, why not make up a Top-100 (or 20, or 50, or whatever) and we’ll compare notes? Anyway, back to my Top-More-than-a-Hundred: instead of crossing off this and that place willy-nilly. I decided to establish a break-away faction – the ‘Top-20 Must-See Cities in the World’, which left room for further additions to the original Top-100, and in doing so making it a Top-100 of exclusively natural and historical uniquenesses. 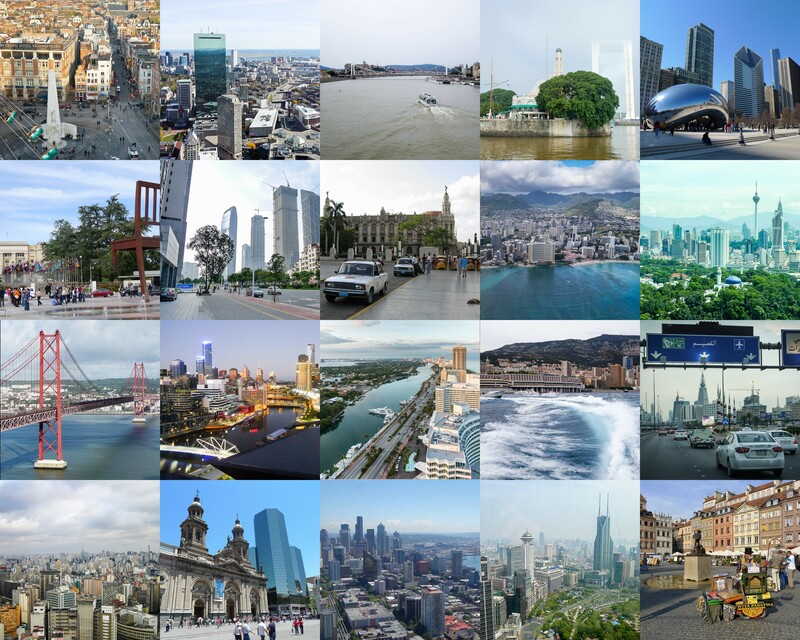 So, in this blogpost – my Top-20 Cities. In future posts in this ‘Top’ series, I’ll do ‘Top’ posts per region: the Americas, Europe, and so on. And after that colossal explanation (! 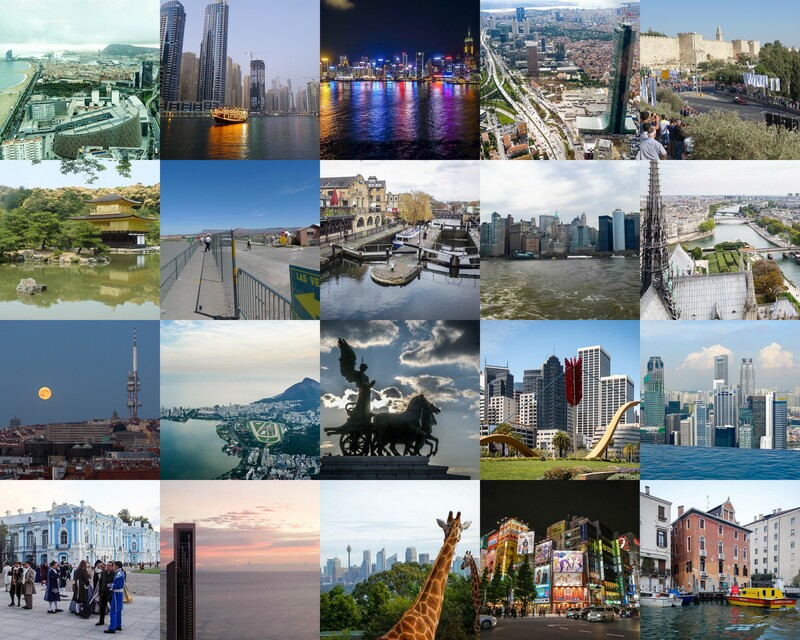 ), herewith, by Top-20 Must-See Cities in the World. Da daah! NB: the pic is clickable. New York (actually, to be more precise, Manhattan). A fascinating place. There’s an unmistakable magical energy about it. It’s always buzzing with life, with never a dull moment. But why here? Why not other US cities? A mystery. I wonder if you took all the folks out of Manhattan the vivacious verve of the place would still be there? 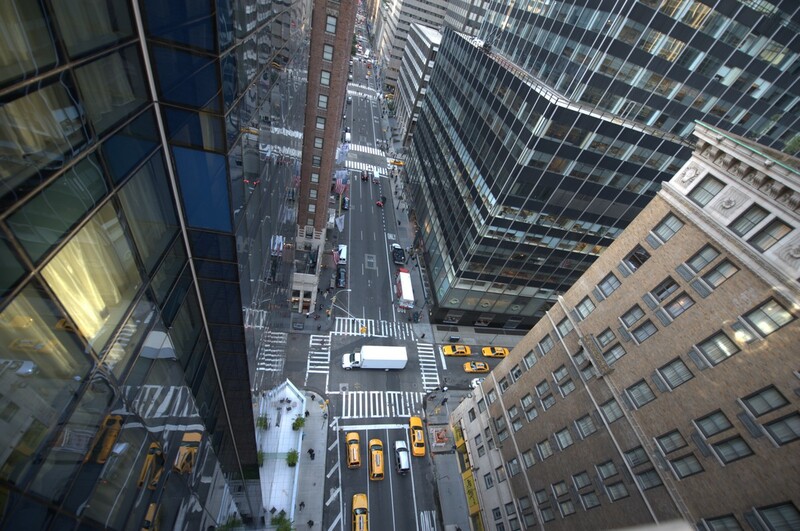 New York – it’s the capital of the world. And though I’d never be mad enough to want to live there, I want to keep getting back to it as often as possible. Don’t just stroll about when here (you might think ‘a dozen-or-so blocks’ means no distance at all, but they do all add up to an exhausting trek if you’re a little over-ambitious). 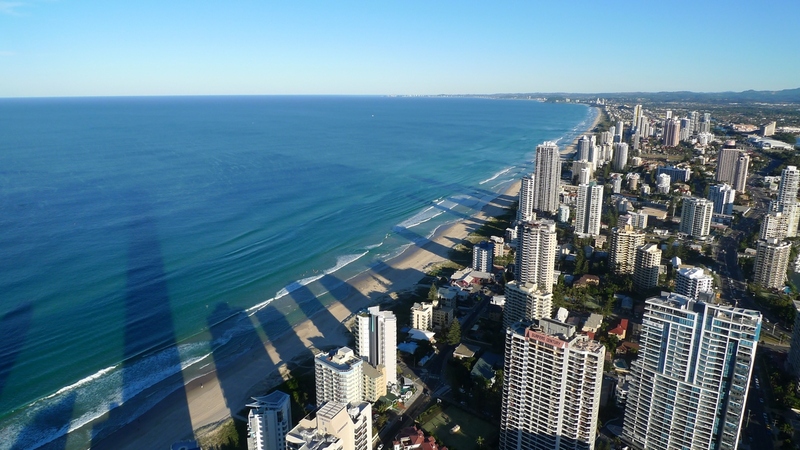 If possible, get up in a helicopter for an awesome aerial perspective. If not possible, at least get up one of the taller skyscrapers to the viewing platform. 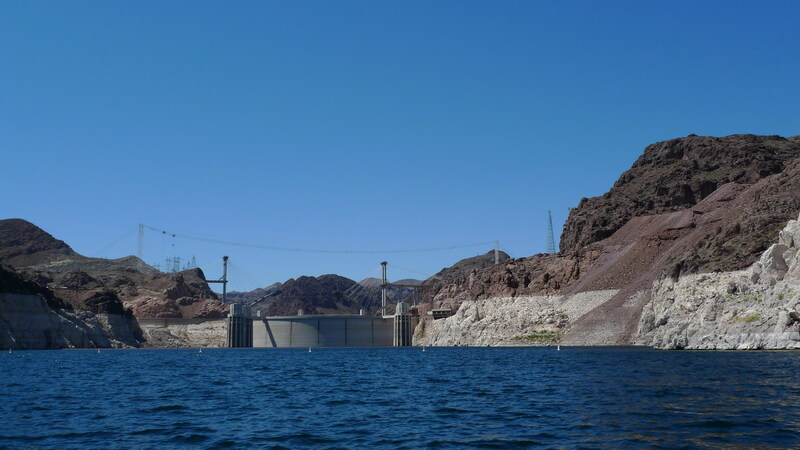 This city isn’t just about gaudy skyscraper hotels, desert, and impossibly immense casinos and gaming halls – no! There’s more to it: it’s how life here never just simmers – it’s always boiling over, and how the city – the Strip and Downtown at least – is a veritable never-ending show. For example, it’s only here you can see the unique performances of Cirque du Soleil ‘O‘ and ‘Ka‘, not to mention all the many other wonderful performances. There are also non-stop concerts, exhibitions, conferences, weddings, and there’s of course so much… legend! Oh what a beautiful city. 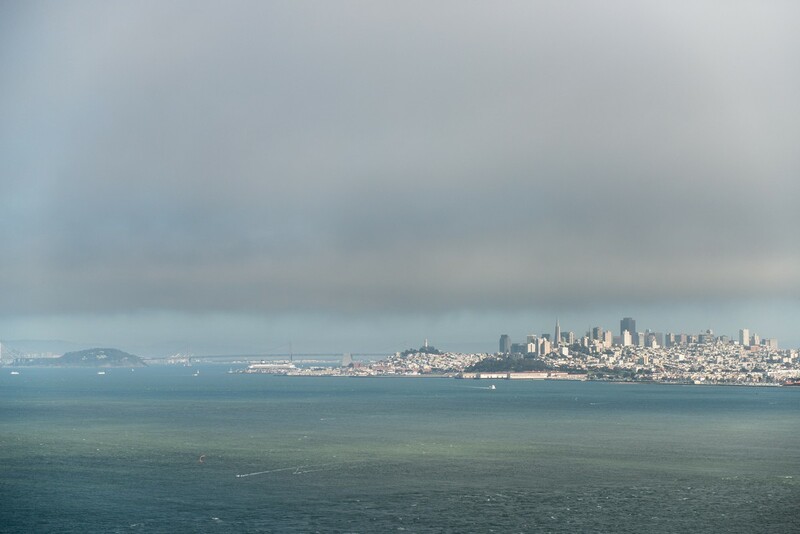 Bodacious bridges, captivating coastlines; plus the eerie island of Alcatraz. 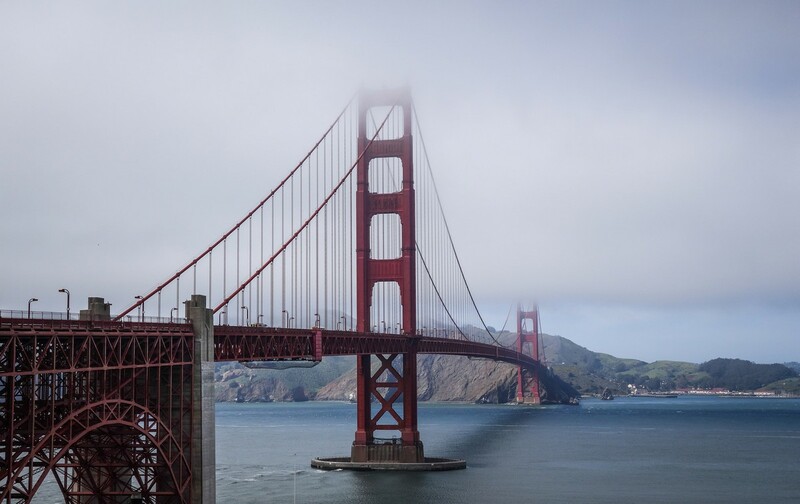 Walking over the Golden Gate Bridge and back again is a dream come true – thoroughly enjoyable. Just beholding it from afar is a delight too. You find yourself staring at it for ages. Any time of day is good for crossing it, but there’s something extra special about early morning or at sunset. The impressions will stay with you your whole lifetime. My impressions are here. Her name is Rio and she dances on a stage of the most magical nature: monumental mountains + brilliant beaches + awesome ocean. 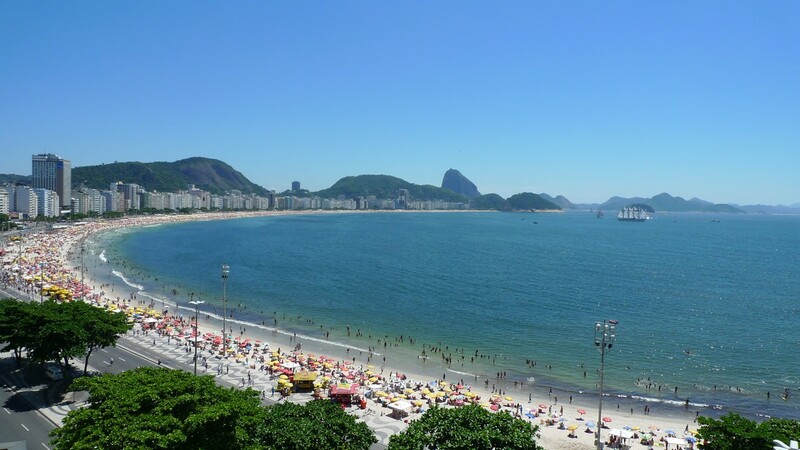 Sugarloaf Mountain, Copacabana and Christ the Redeemer are all must-visits. It’s best not to delve too deeply into the city itself – as you’ll get robbed! But a stroll along the beach, a climb up the mountain, and waiting for the sunset slowing sipping a caipirinha – oh yes. I’ve yet to see daybreak in Rio. Most regretful. What better excuse for getting back there asap?! Some 20 years ago, I didn’t like this city one bit. But gradually it became… cozier, more convenient and comfortable… brighter. Today it’s like a different city altogether! There’s never a dull moment in London. Tired of London? Tired of life – indeed! But if you do get momentarily tired – there’s always the pub – now open practically all hours (pubs in the UK used to close every night at 11pm. Not anymore. Told you London just keeps getting better:). …For this place needs to be visited and returned to again and again. 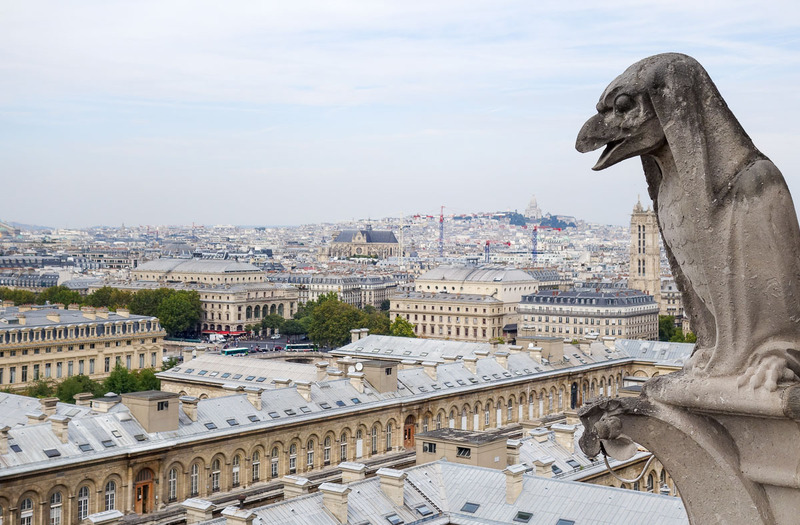 My three fave places – perhaps not all that difficult to guess – are: the Eiffel Tower, Notre Dame and the Pompidou Center. But there’s so much more to the city besides. For the first-timer, there’s an easy option for getting a good intro to the pulse of the city: you get yourself to somewhere in the center on the metro, and then just walk, and on the first boulevard you get to, sit at a table, order an espresso (morning), beer (evening), or wine (not for me thank you; I’m no fan of the grape), and then just simply people watch Parisian watch, observing the toing and froing and letting the city’s bustle wash over you at a comfortable distance. That might sound a little lazy, maybe even boring. I assure you – it ain’t! The city of the great Gaudi. Gran Via, La Rambla, embankments, a user-friendly city layout: it all adds up to an aesthetically pleasing inner-city experience of the highest order. Nearby isn’t bad either: Montserrat, Figueres (the Dali Museum), and Costa Brava – whose coastal road I heartily recommend a drive along – in a soft-top, naturally. The slow-moving Vltava. Probably the most comfortable city in Europe. This city’s like something out of a fairy tale. A gothic castle, ancient cathedral, cobbled back streets. All of that adds up to a wonderful day of strolling and snapping, all washed down with the city’s phenomenally magical beer. And for dinner – vepřové koleno. Incidentally, based on personal experience, Prague’s relaxed atmosphere is the perfect location for overwhelmed tech-heads to unwind after heroic feats at work. You a tech-head? 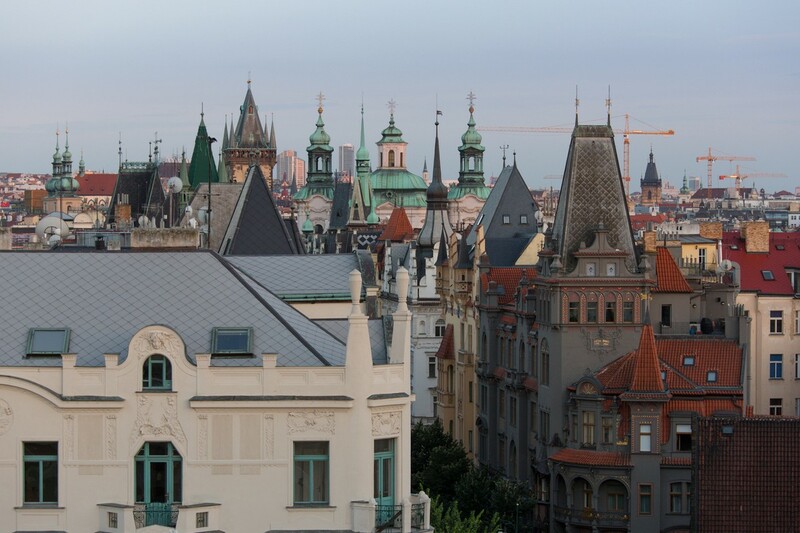 Get to Prague for some serious chillage! The Eternal City. ‘All roads lead to Rome’? – just the opposite! All roads come from Rome! A heady brew of historic buildings, ruins and scooters. A crazy mix. You could pass on modern Rome – nothing original there. And like with many other places, it’s best to come here in low season – so other tourists don’t get in the way when taking pics. The Colosseum, the Pantheon, the Trevi Fountain, and on and on… Rome, baby! St. Peter’s Basilica in Vatican City is also a must-see. Plus inside the cathedral. And the Vatican Museums, which I’ve tried finding the time for three times now, but, alas, Rome has always slowed me down. The museums’ opening times are… lazy, too, so check in advance to avoid disappointment. 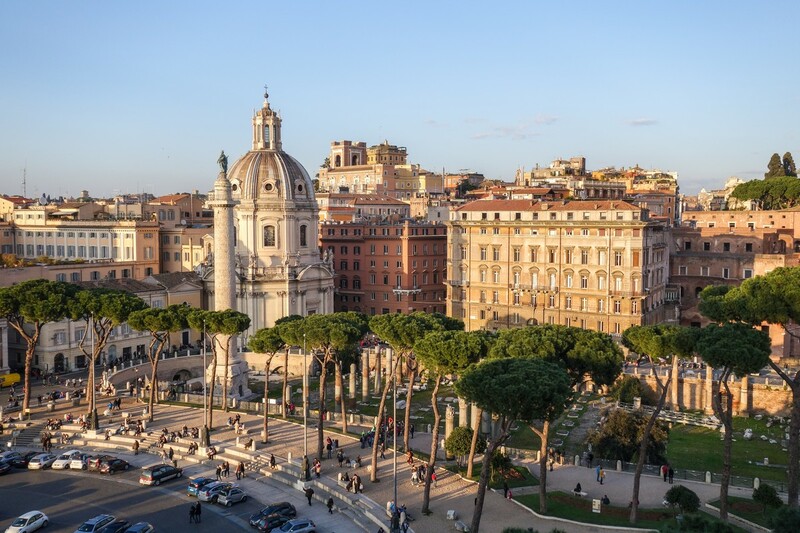 Besides that, a few other prerequisites to guarantee enjoyment in Rome: the non-touristy season, good weather, comfortable shoes, Band-Aids, city guide, and you’re off! Perhaps the most unusual city in the world. For there are no cars here! None! 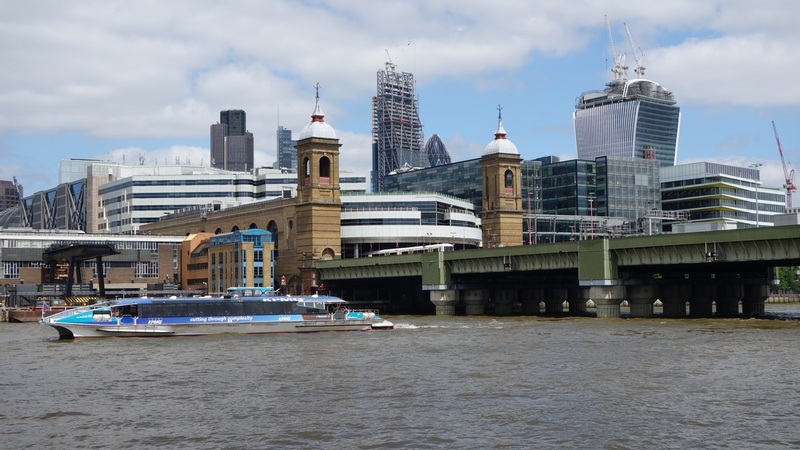 Buses, taxis, police vehicles, ambulances, plumbers’ vehicles – they’re all boats! (And the public transportation here isn’t cheap either, incidentally). 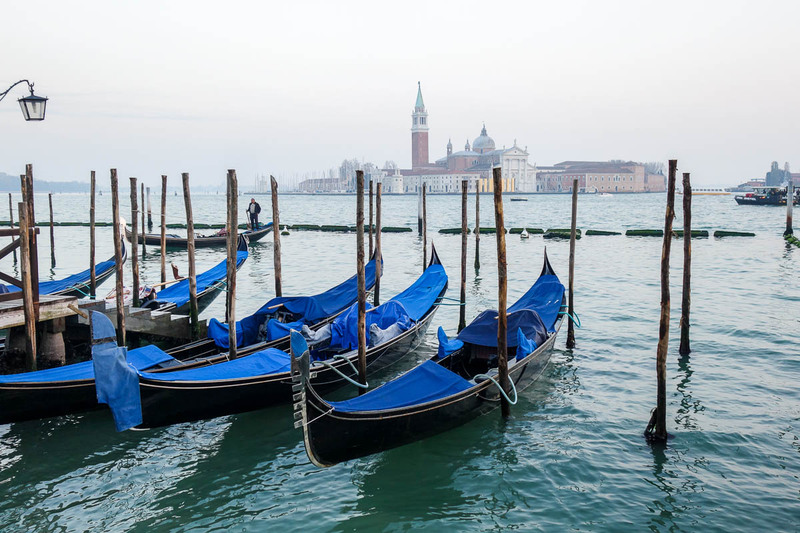 For there are no streets here – just canals. Water instead of asphalt. Water instead of gardens too! 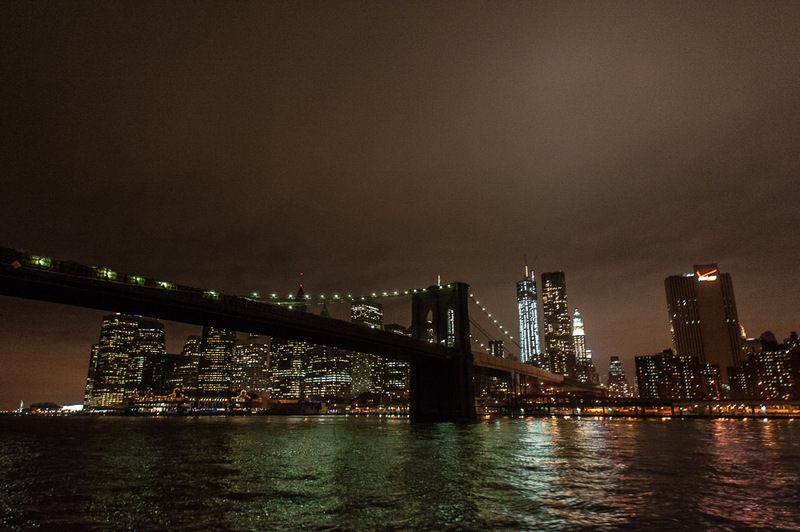 If visited in summer you get to see the bridges getting raised of a White Night: to me, the most stunningly spectacular nighttime scene – ever! 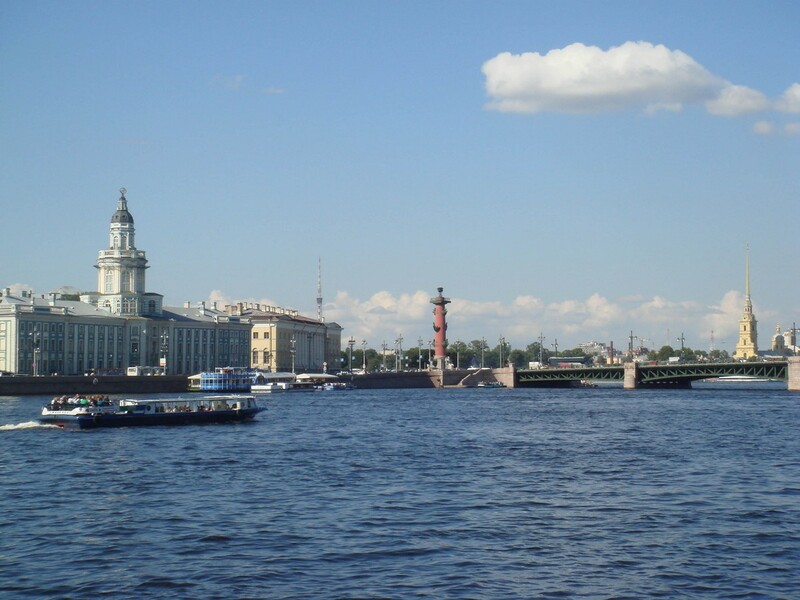 There’s also the amazing classical architecture, plus the special je ne sais quoi spirit of the northern capital of Russia… Oh, and there’s also the city’s reasonable claim to being the most imperial (one-time) capital of Europe. Yes, it gives both Rome and London a run for their euro and pounds on that count. Until recently I was brazen enough to have not been to the city since… 2008 – seven years ago! I made up for this flagrant behavior just this summer – and about time too. Check out my mini-series of several blogposts on of the northern capital for more background on the city’s highlights. 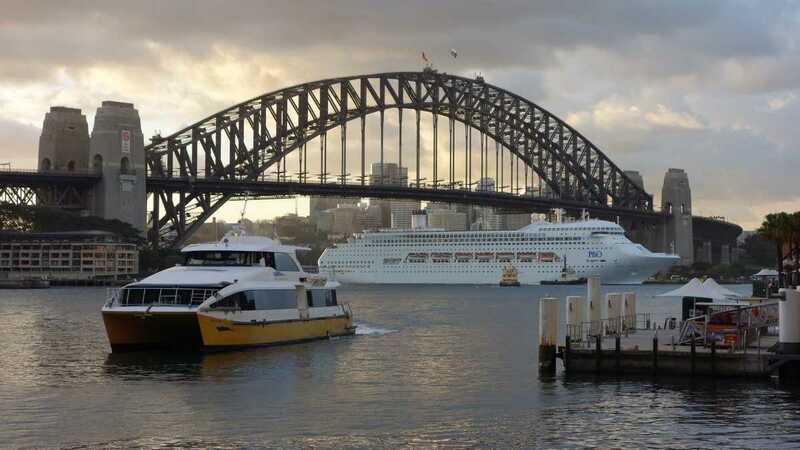 What other city can boast being situated on two continents? 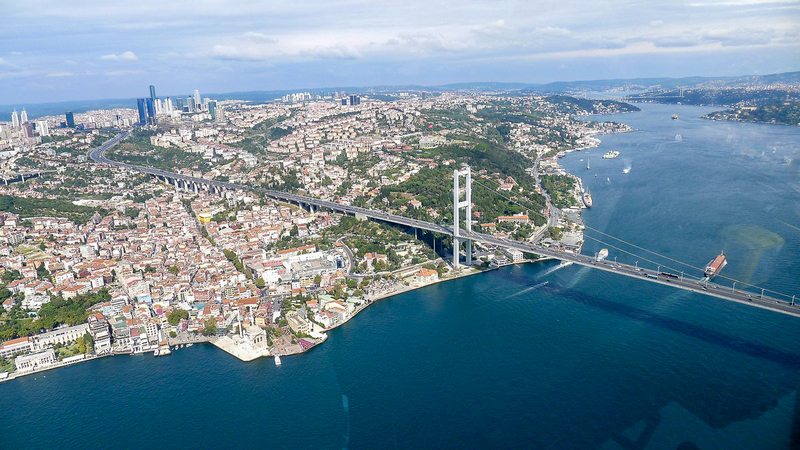 And if you fly to Istanbul from afar (from a third continent) and for the first time, then be sure to take a taxi right away upon landing and cross the Bosphorus; then you’d be able to boast being in three continents in one day! Then have dinner somewhere along the shore and watch the ships sailing to and fro under the illuminated bridges connecting Europe and Asia. Only then are you allowed to finally get to your hotel! Next day, get your sneakers on and get strolling around the old city, checking out its markets, ancient mosques, narrow cobbled streets with cafes, and other assorted touristic delights, not forgetting to delve into its rich and checkered history as you do. A very ancient city. So much so, the brain has trouble taking in such phrases as ‘this modern replica is a mere 700 years old’! 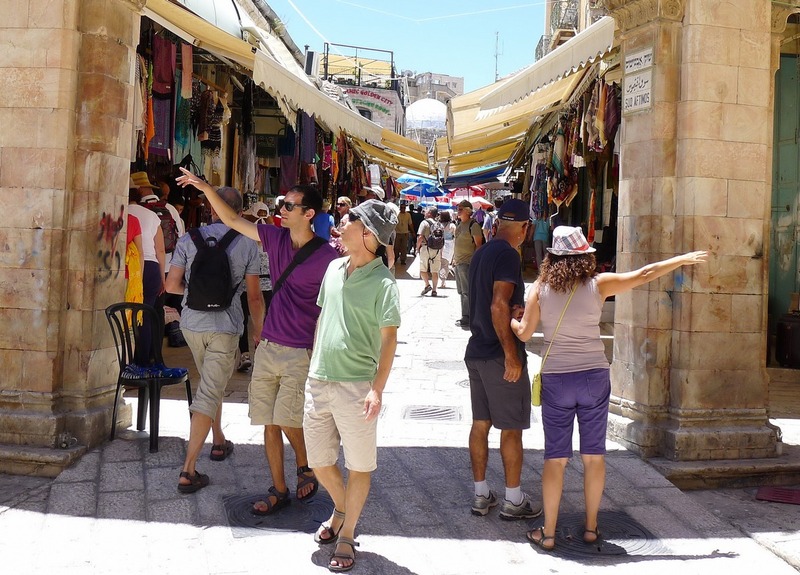 A walk around the Old City is quite clearly mandatory: diving into the labyrinth of narrow streets and the potpourri of different styles, and taking in the Temple Mount and the Wailing Wall. 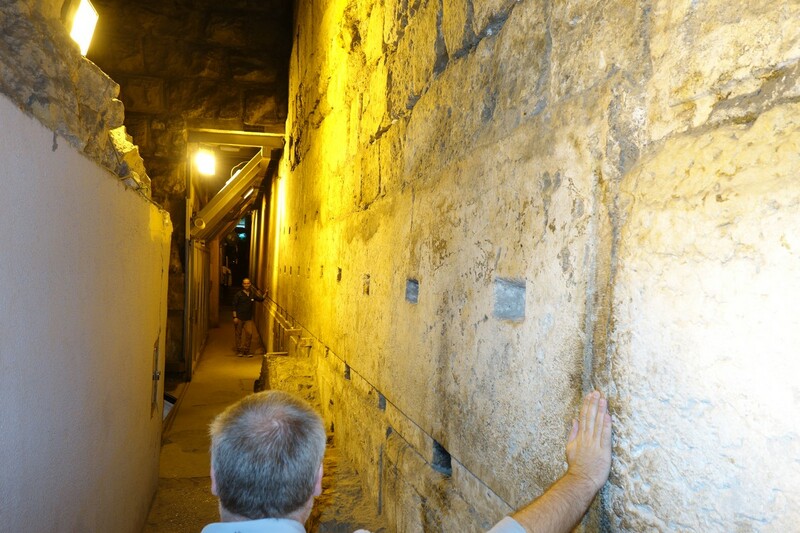 And if you’re very lucky (because it normally requires special permission) you can go down into the ancient tunnels under the walls of the Temple Mount, and place a hand, like me here in the below pic, up against the cold, rough eternity the wall embodies. A unique city, with no other anything like it. It’s sometimes referred to as ‘Dubaihattan’ due to all its skyscrapers these days. And who’d have thought it would resemble Manhattan half a century ago when it was just a tiny village in the desert? 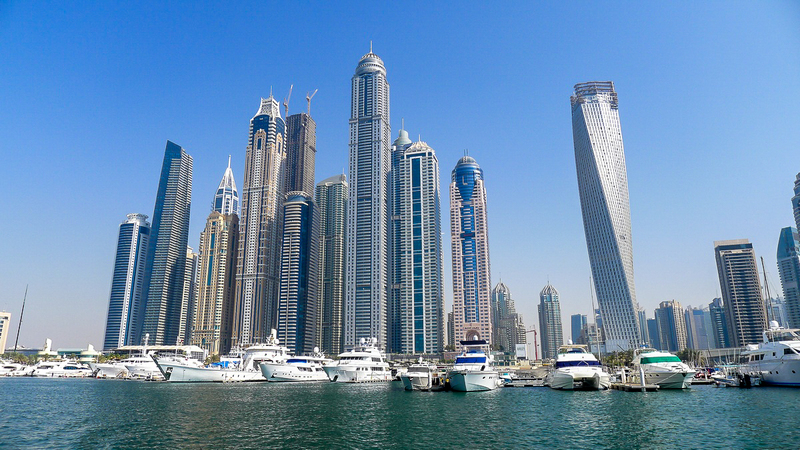 Listing Dubai’s wonders I’m sure isn’t needed – everyone knows about them already. 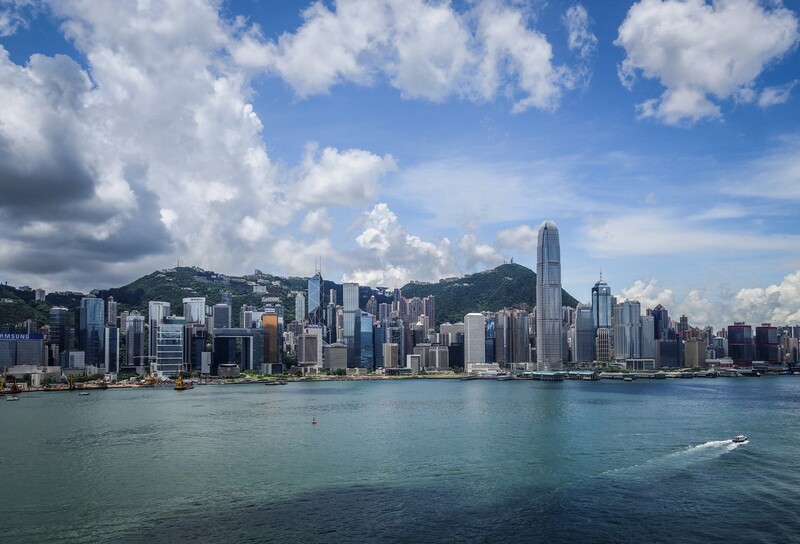 Artificial islands, gigantic shopping malls, minimal taxation… wait a minute – this is a touristy Top-20 ). 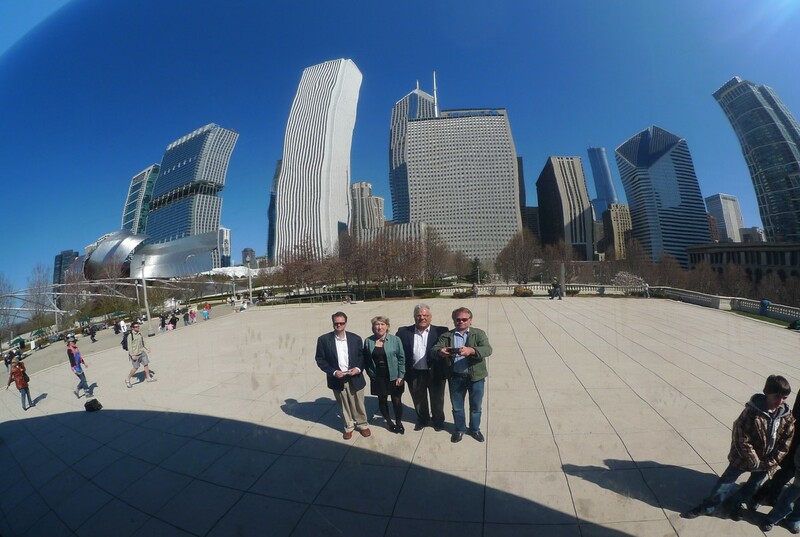 Not to worry – the city’s got super touristy bits in spades too. Must-checks: Burj Khalifa, the aquarium and aqua park at the Atlantis hotel, sea excursions along the coast, plus swimming in the gulf. It’s like another world, no matter how you look at it. It’s got this wacky energy and barmy drive. There’s the incessant clatter of Akihabara, Ginza and Shibuya. There’s the sushi, sashimi, wasabi, shabu-shabu; you could lose yourself in the topology of its subway forever; taxi doors open and close automatically (and all taxi drivers where white gloves); there’s the impeccable cleanliness, preciseness and politeness; and there’s the quiet and calm of the nearby parks. 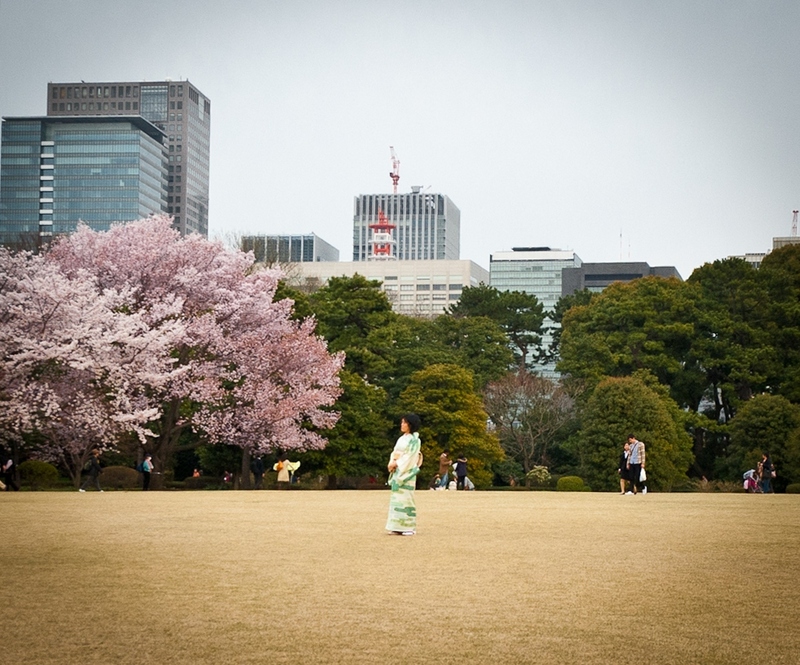 A walk around the Imperial Palace is mandatory, especially if the cherry trees are blossoming. 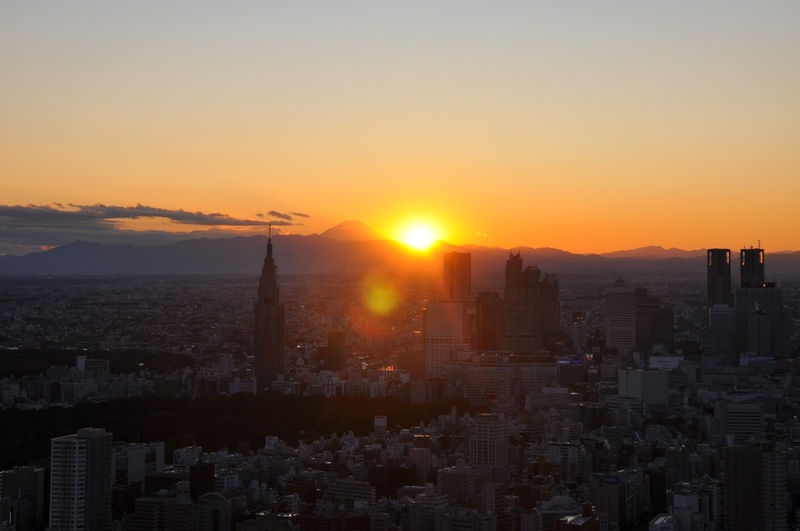 But there’s much more besides to see in Tokyo – all of it fascinating. 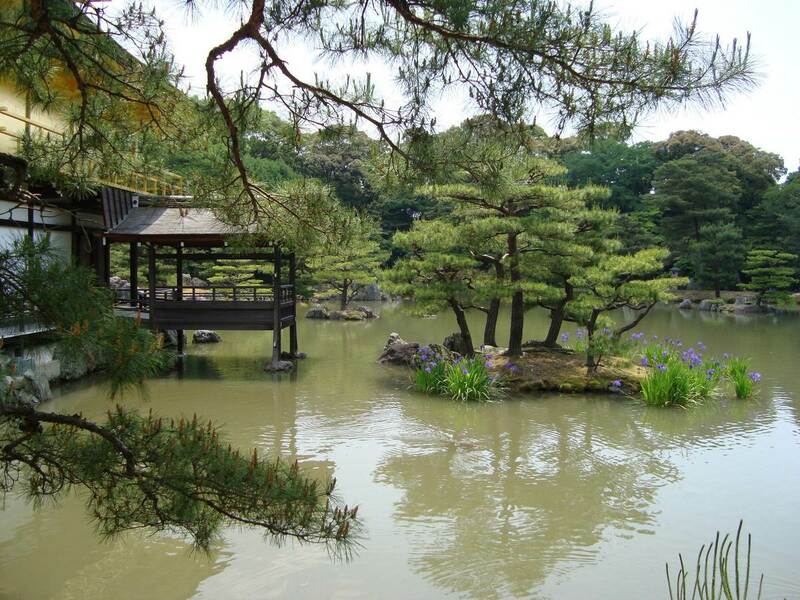 The former capital of Japan, artistically adorned with ancient palaces, cathedrals and gardens. Unforgettable. In autumn, up into the mountains the whole scene gets painted in different shades of sparkling red and gold. Also don’t miss: the samurai village near the city. For a small fee you get to dress up as a samurai – or geisha. Yet another ‘other world’ – of skyscrapers and hustle and bustle all packed into a relatively small space, and with correspondingly stratospheric real estate prices. 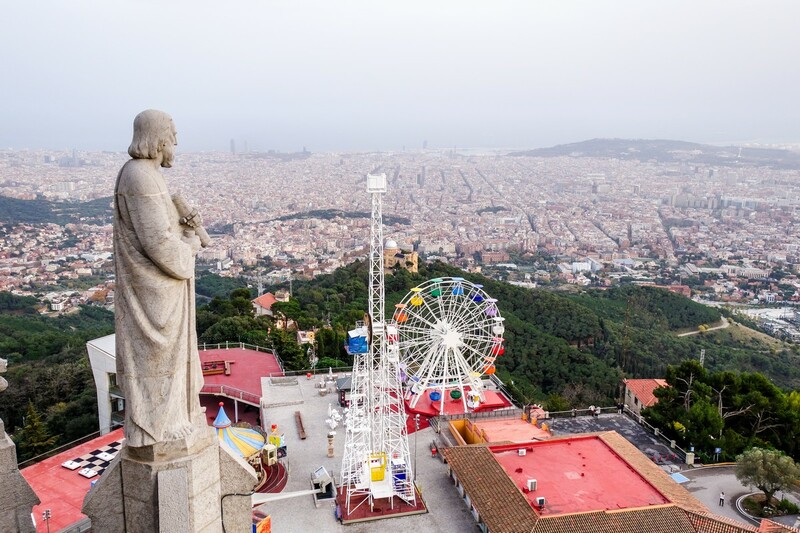 The average tourist knows about and comes to see just the façade of the city – the noisy streets, the shopping, the funicular rides up the surrounding slopes. However, there is a flip side to all that: parks, forests, islands and the ocean: all of which, you’ve guessed it: must-sees! A garden-city. Or should that be a city-garden? Clean, bright, with green vegetation everywhere you chance to look – without exception! The fish restaurants on Long Beach – oh my word, probably the best in the world (actually, maybe after Hong Kong). 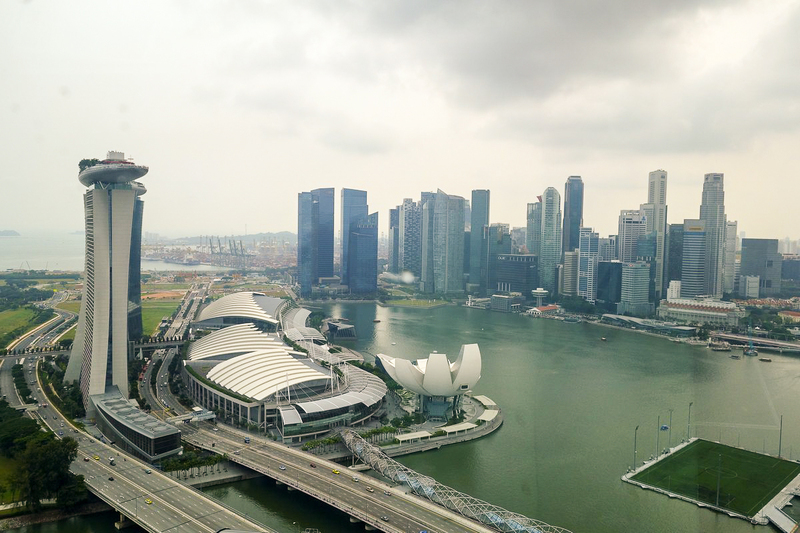 A stroll around Marina Bay and the Botanic Gardens, plus a ride on the Singapore Flyer – all obligatory. And if you’re lucky, you might just catch the Formula-1 Grand Prix at night. A most beautiful bay and a very pleasant city. The famous Opera House, Harbour Bridge (and excursions up it, Darling Harbour, the fish market, Bondi Beach and sharks… oops, that last word was inappropriate). Taronga Zoo; the Royal Botanic Gardens – where there used to hang and fly hundreds of thousands of bats (but they seem to have disappeared). In short, Sydney – it’s beautiful, groovy, and right-on, man. Plus not far away there’s the Blue Mountains National Park, multicolored magical mystery tours in massive caves, and a lot more other interesting stuff; so schedule at least two or three days for super Sydney! This is a relatively small town on the very easternmost shore of Oz, but its meager size doesn’t stop it from being one of the most… correct places on the planet. It is indeed paradise – and not only for surfers. Ocean, beaches, a national park, and fun to suit all tastes. A breathtaking place in all respects. I’ve been there plenty of times, and for sure will be returning… again and again. I could have added to this list plenty of other cities, like Vancouver, Lisbon, Amsterdam, Budapest and Melbourne. However, due to various subjective drawbacks of each, plus the need to have the round figure of 20, they simply didn’t make it. Maybe some will make it onto the update around 2020? Then for dessert a touristic brainteaser for you. Another 20 cities – none of which is in the Top-20 – just for you to test your geographical knowledge on. Note: the pic is clickable. You are a great personality and one of the IT person I admire most. Your work and company are so much valuable to the world. I am very impressed with all the places you have been to! Unfortunately, No City/Place mentioned among the 120 cities is located in Africa. I am hereby inviting you to Africa. Come let me tour you at the Summit of the second highest Peak in Africa. (Mount Cameroon). I also wish to invite you to visit our facebook page for more sightseeing places we have been to. Hope this note reaches you in perfect health.